So what are the best steak knives you can buy? This question, like so many when it comes to purchasing quality cutlery, actually depends on a few variables. The main one being, how much money have you got to spend? 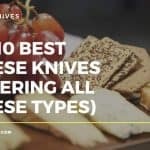 This list could be made up of the highest priced steak knife sets, from well known quality brands such as Shun and Whustof, and yes, you’d be guaranteed to have a knife that performs very well and will look lovely to boot. However, not all of us can afford to buy a set of steak knives where each individual knife costs over $200. With that in mind, this list is all about affordability and quality combined. The best steak knives have sharp blades with well made handles that are easy to grip. For this you do not have to spend a fortune. However, the top brands are still in this list – we have just included those items that are both extremely well made yet won’t break the bank to purchase. Oh, and they will look damn lovely when you host a dinner party too. 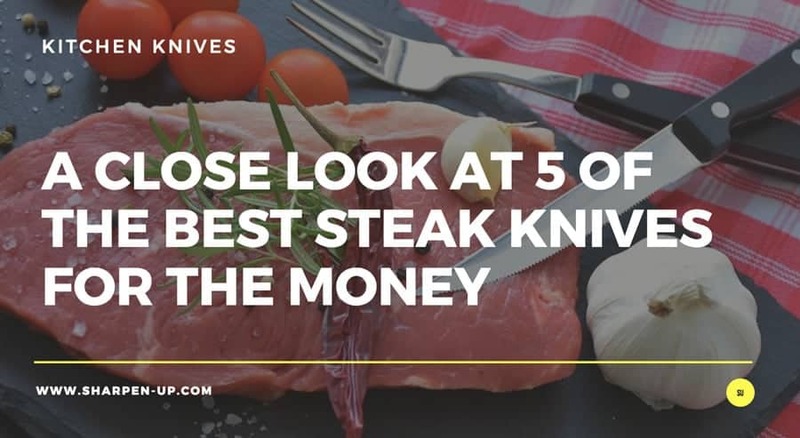 When you’re in the market for buying the best steak knives for your budget, the most important issue to consider is the balance of quality over cost. Even if you wish to spend very little, it is still more than possible to buy a steak knife set to suit your needs. There is a 4th issue to consider when buying a steak knife, however this one can often come at a cost on the pocket. The truth is, many steak knives look beautiful. In a way, this has always been a significant design priority for this type of knife. The steak knife set is designed to be used when you are entertaining, you should want that set to look and feel as elegant as possible. As you will see from our top 5 list, whether the design is contemporary, or influenced by the historical French elite with the Laguiole style – they all do a good job of looking fantastic. When buying a steak knife set, you will want to make sure that the style appeals to your sense of aesthetic too. This may sound like a very obvious comment to make, however the fact steak knives need to cut against porcelain rather than a chopping board, means that material and strength are paramount. Cutting boards are forgiving. Plates are not. 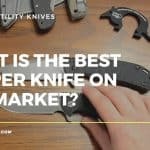 Again, in accordance to your budget you should try to purchase knives with the best steel and build quality that you can. That way, you will have a beautiful set of steak knives that will last you many years to come. 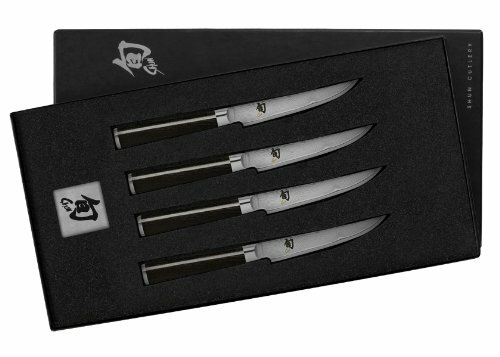 The DMS400 Shun steak knife set is all you would expect from the world renowned knife manufacturers Shun Cutlery. The level of craftsmanship is impressive here, with this Asian inspired steak knife set coming from Shun’s Classic cutlery line. With an apparent nod to the hand-forged knives of ancient Japan, this beautiful set is made with a VG-MAX “super steel” core. For extra strength, this is then surrounded by layered Damascus cladding which protects the core and provides stain resistance. This shun steak knife set features four – 4-3/4 inch steak knives, so as long as you’re not throwing a medieval style banquet, it will suit all your family meal time carnivorous needs. Each knife has a thin, 16 degree blade angle that is razor sharp. The blade will glide through your steaks with ease; cutting fewer capillaries in the meat too, meaning more of those succulent juices remain inside. The finish is lovely on the Shun Classic Steak-Knife Set. The D-shaped ebony Pakkawood handles look sophisticated without being too ornate, (or ‘showy’), and have a real contemporary vibe to them. Shun classic quality at the mid-range price point, these steak knives are a quite simply a pleasure to use. Easy on the eye, (and not too bad on the wallet) they are an essential purchase for someone on the look out for a top quality steak knife set. Backed by a manufacturer’s limited lifetime warranty, it is hard to see where you could go wrong with this particular Shun steak knife set. If you came across Sharpen-up via a Google search, it is very likely that you are already aware of the Shun name. A bold statement to name your company, but one that Shun has consistently been able to live up to with the release of each new product line. 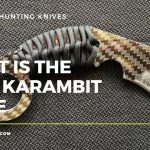 One of the factors that set the company apart is the traditional knife making style they manage to bring to even their most widely reproduced instruments. Highly skilled artisans at the Kai Corporation (the parent company of “Shun”) have been making quality knives for well over a century, with the techniques used in the process stretching much further back than that. Each and every knife is handmade, with what the company report to be approximately 100 meticulous steps completed along the way. This is the quality that ends up on your dinner table, enabling you to slice through your steak as if it were a nob of hot butter. 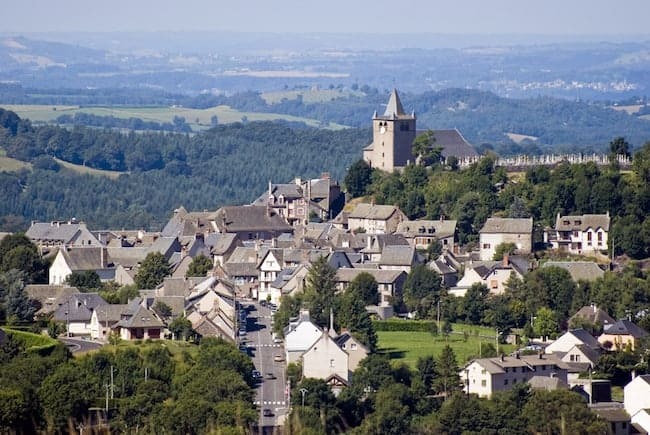 Just as the Champagne region of France gives its name to one of the world’s most prestigious drinks, so to has the French region of Laguiole become synonymous with providing the world with beautiful cutlery. Owning a piece of Laguiole cutlery is like stepping back in time to a world when France had an aristocratic elite. Those guys demanded nothing but the best, especially when it came to style and quality of the items they owned. It stands to reason that the cutlery to adorn their tables was exquisitely crafted by hand, and beautifully ornate. Thankfully for us, those skills still exist today, with cutlery from France’s Laguiole region demonstrating the hallmarks of that prestigious past. However, you do need to be careful when purchasing knives with the Laguiole mark. In recent years, (as all too often happens in business) the name has been trademarked. You will find it on cutlery that hasn’t been anywhere near Laguiole, or France, or even the same continent. A lot now comes from China. So we have three steak knives in this sub-section. Review 1, is an affordable steak knife set that is actually hand-crafted in France. The 2nd is one of the made in China sets that is still worth a look. The 3rd is one of the best Laguiole steak knife sets currently available, (for those with very deep pockets). 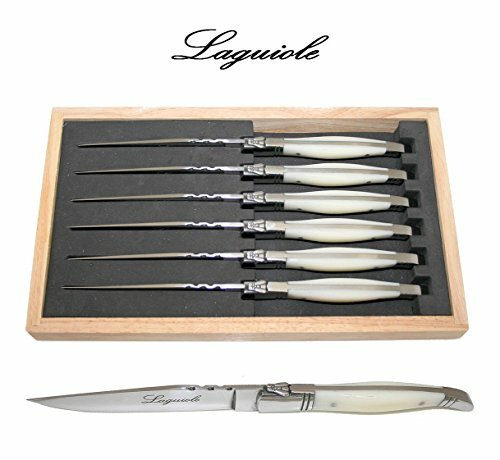 This Laguiole 6 steak knives set actually comes from Frace. Each individual knife is 9″ in length with a 20/10 stainless steel blade. The finish is what you’re paying for with a true Laguiole knife set and you will not be disappointed. The picasso ivory color used for the handle really does look exquisite. 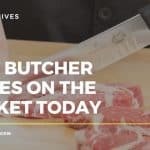 While the materials used do not live up to some of the other steak knife sets in this list, the blades are still very much sharp enough to do what they are designed to do. The stainless steel bolster rivets fix the instrument together well, and the solid handle feels weighty enough in the hand, increasing that sense of well made quality. 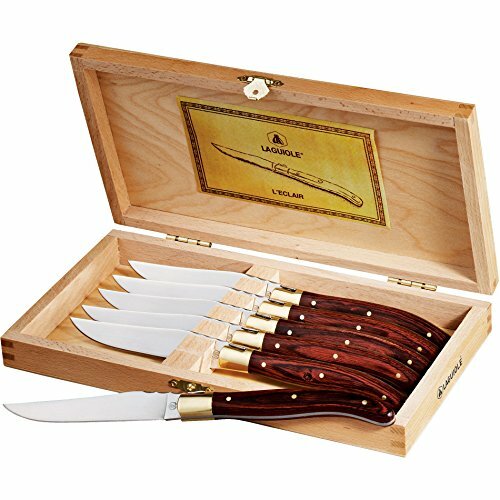 Most importantly, these knives are delivered directly from France and packaged in a wooden Laguiole presentation box that you will want to show the neighbours. Out of the 3 ‘Laguiole’ steak knife sets that we review here, this made our top 5 list of best steak knives for the fact it is actually crafted from the Laguiole region of France and is affordable to most. 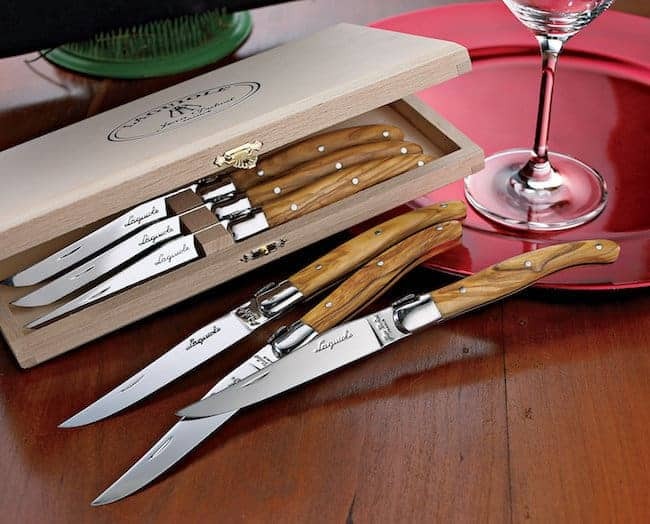 This six-piece stainless steel knife set offers a sense of what traditional Laguiole knife-making is all about, without the expense. This is one of the many Laguiole steak knife sets available that is made in China. However, this should not necessarily put you off. This set is considerably more affordable than the others in this sub-list. 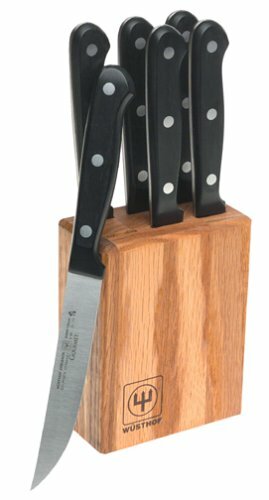 The six matching 9″ steak knives are crafted with a sleek wood-finish handle, complete with an etching of the famous Laguiole bee, (the trademark that has been sold off to manufacturers). The polished stainless steel blade is no where close to the sharpness you will find on the other blades reviewed on this page, which is a significant problem with this set. You can of course decide to hone the knives yourself, should you have the tools at home to do so. The wooden case is a nice touch, in keeping with the heritage that the knives purport to stem from, but the quality again isn’t quite there. This Laguiole 6 Piece Steak Knife Set is all about balancing the lower price point with higher aesthetic aspirations, which is something it does very well. Here you have it, the genuine Laguiole article. Maybe one of the best steak knives in the world? At the time of writing a set of 4 would set you back close to $1000. No expense has been spared here. The materials used in the crafting of this instrument include, exotic centuries-old wood, marble horn and some of the finest steel forged in Europe. Each knife is handcrafted of course, (in fact you can’t even buy them as a set so bespoke is the process – these are purchased individually). A steak knife of this quality is a real treasure. Worth the money however? We’ll leave you to decide on that one. 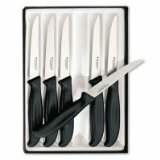 This set is part of Wüsthof’s Gourmet series of knives, which is a more affordable range when compared to the Wusthof Classic series of cutlery. The renowned German attention to detail is still present; the blades are made of high-carbon steel with a stain-resistant alloy, (using slightly thinner quality metal than the top Wusthof products, but the cost saving has to come from somewhere). These are also cut by a precision laser instead of by hand. The ergonomic blades perform very well indeed. Cut to a precision shape by computer, the tip to bolster tapering is perfect on every one, (if not, they don’t make it out of the factory). The blades are 4.5 inches long and are extremely sharp out of the box. You’ll be slicing through a variety of meats with ease using these Wusthof steak knives. Full tangs extend through the synthetic traditional-style handles, which are triple-riveted for strength. They are also dishwasher safe, (hand washing is recommended however). You also get the limited lifetime Wusthof Guarantee. The oak block is a nice addition, however is slightly utilitarian in its overall style. The Gourmet series is an excellent alternative for those who want to own quality Wüsthof cutlery but are on a budget. They may not look as overtly stylish as some of the other steak knife sets in our list however the perform extremely well for the money. Although there are number of Wusthof steak knife sets available, this is the one to go for. A good solid purchase. Wusthof have an extremely good reputation for the cutlery that they produce. Professional chefs and cooking enthusiasts all over the world use these German made tools. The company began in 1814, and has long since set the standard for designing and manufacturing precision-forged knives. Their production continues to take place in Germany today, run by a skilled team of 300 dedicated workers in two state-of-the-art facilities in Solingen. The company claim that over 40 different manufacturing steps are needed to produce a forged Wusthof knife. It is this attention to detail that ensures when you buy an instrument with the Wusthof stamp, you’ll be getting something that will live up to the job in hand. Victorinox hardly need an introduction. Started in 1884 in Switzerland, the company is synonymous as the manufacturer of the Original Swiss Army Knife. Thankfully for us, the high quality craftsmanship that led them to become the most well known manufacturer of pocket knives has now moved into the kitchen. Today Victorinox by R.H. Forschner makes everyday cutlery for the home as well high grade tools for the professional kitchen. 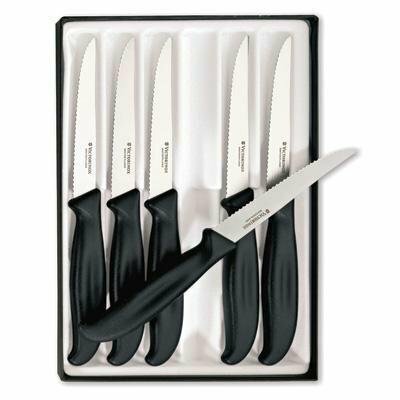 This 6 piece Victorinox knife set (model 88792), is a fantastic entry level set for those on a budget. It’s power without the price on these ones. To keep the cost down, the blades are stamped rather than forged. As with the other steak knife sets on our list that employ the same cost saving process, you should not be put off by this. The high-carbon, stainless steel is extremely durable. Edge retention is good, with the the ground, tempered blades able to maintain their razor-sharpness for a considerable length of time. What’s more, the special tempering process used means that the edge can be resharpened over and over again. This really is a set you will be able to use for a very long time. Each knife features a pointed tip and serrated edge for easy slicing of your steaks. An ergonomic approach has been taken to the design of the handle. Shaped to minimize wrist tension, they are well balanced and offer good heft with a comfortable grip. 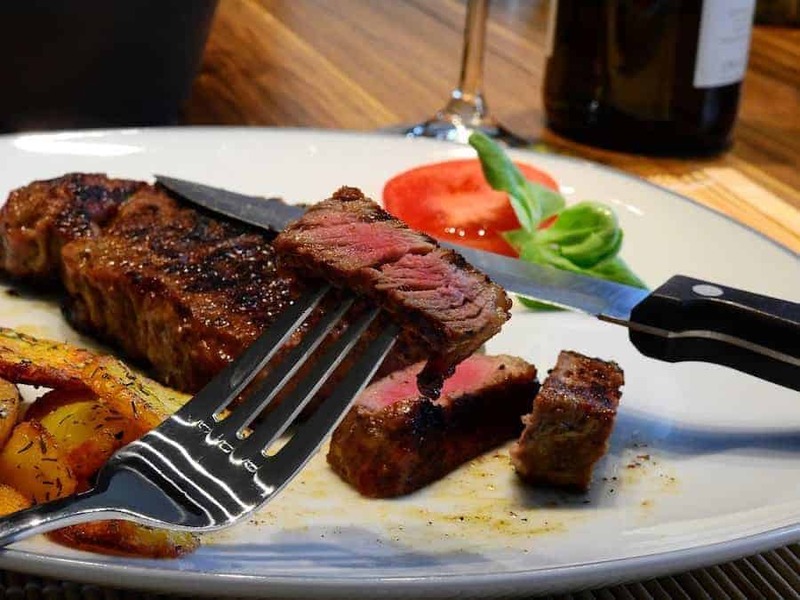 (The curved finger guard is also useful for ensuring your hand doesn’t slip if it gets greasy or wet, something that a good juicy steak can often do). The fact there are no grooves or rivets in the construction of these Victorinox steak knives, helps prevent bacteria getting tucked away in any crevices. Overall the 88792 Victorinox 6-Piece Steak Knife Set is a great purchase for those that are not in the market for spending vast sums. They are well designed, lightweight, extremely sharp, and able to take care care of your steak slicing with ease. 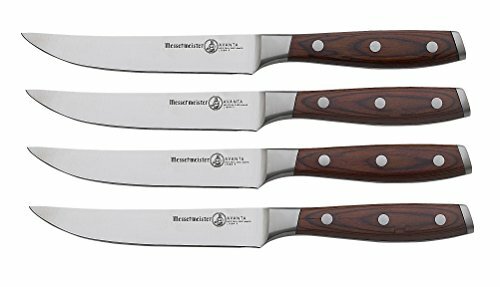 The Messermeister Avanta steak knife set consist of 4 knives with a 5″ fine edge blades with an upswept boning tip. As with the other lower priced solutions in our list, the steel is stamped rather than hand crafted. However, although these knives are made in China they are constructed from German high carbon stainless steel and are one piece forged. Straight from the factory these knives are sharp. However, because the knives employ a straight fine edge, they do need to be sharpened more often than serrated steak knives. The gradually cambered long blade leading to the upward tip designed to allow for easier separation of meat from bone. The overall length with the rather lovely pakkawood handle makes for a nicely balanced steak knife that feels solid in the hand. The Messermeister Avanta 4-Piece Fine Edge make our best steak knives list for the fact they balance value for money with a robust performance. They are well made, very sharp and provide a no fuss solution to your steak slicing needs. The company may be a bit of an outsider when compared to the others reviewed here, but by no means should you dismiss this product. Well worth checking out.